With our lake house fixer upper in full swing, I can’t help but get excited at the thought of backyard barbecues. 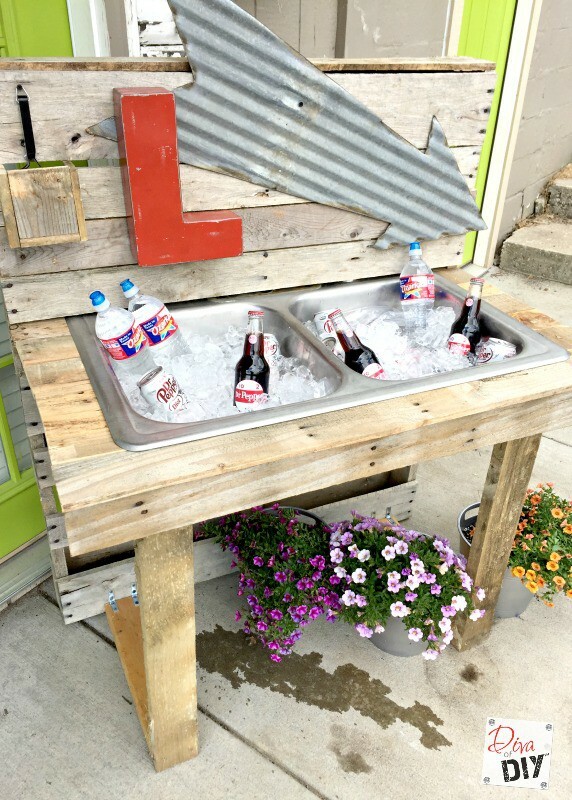 Wouldn’t this DIY cooler be amazing sitting out by the dock? 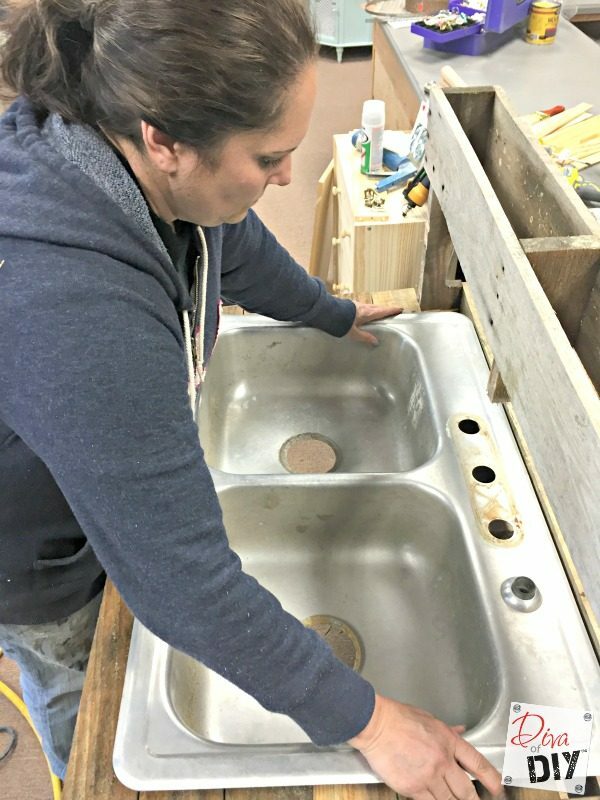 And… bonus, I didn’t even have to get this sink at Restore because we took one out of the lake house so I used that one. 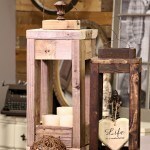 That is a true upcycler/repurposers dream! 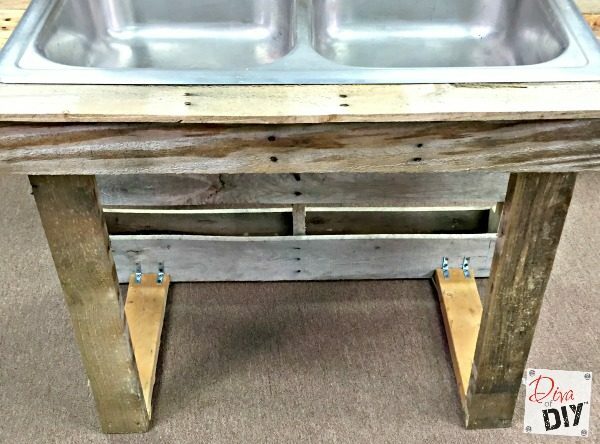 I was able to use something from the old house, that would normally just be discarded, and repurpose it into something useful for the new one! 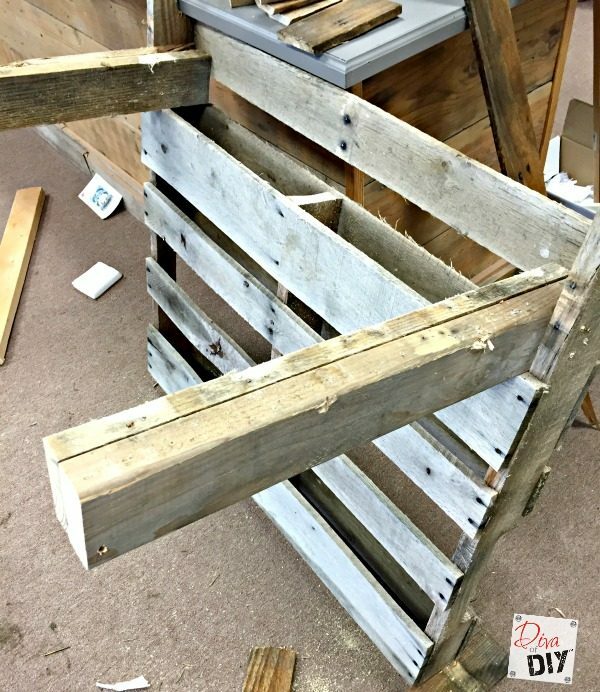 *Diva tip- when making a pallet project and it’s been raining for a month, bring them in to dry, taking apart a wet pallet is no fun because the wood has swelled. Ugh! 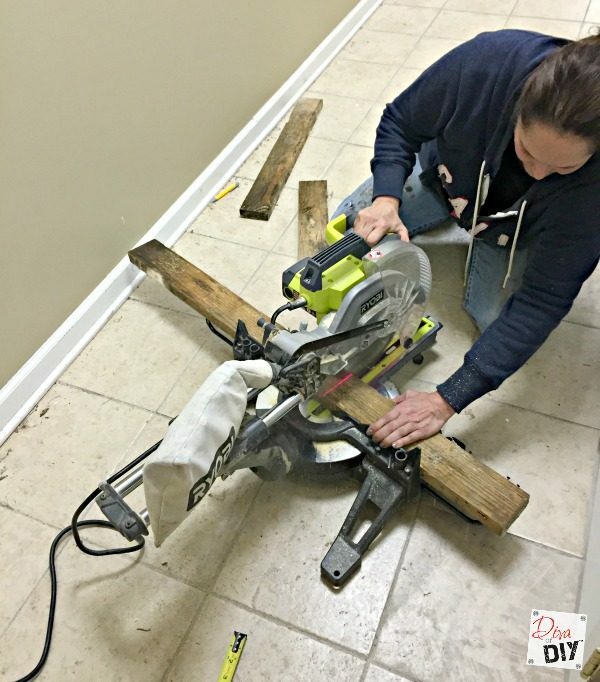 Step 1) Using your reciprocating saw, remove all of the boards from one pallet. 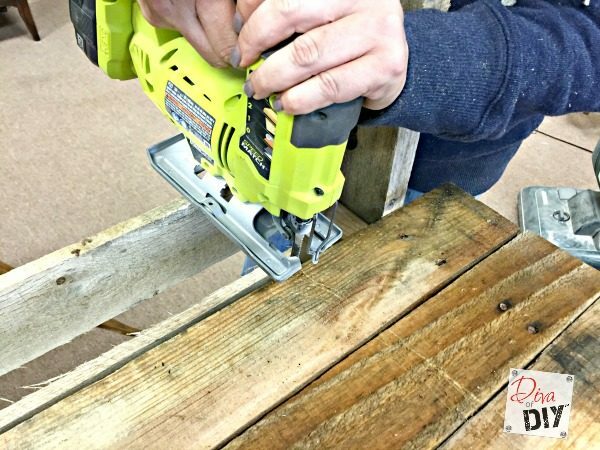 I personally like to cut right through the nails because I like the look of the nails left in the boards. 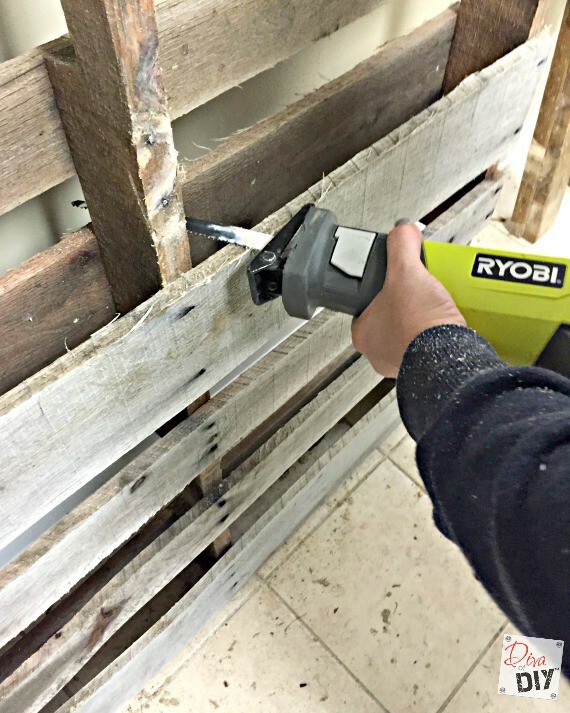 Step 2) Remove the top 1/2 of the pallet boards from the second pallet. Save them because you will re-attach them later. 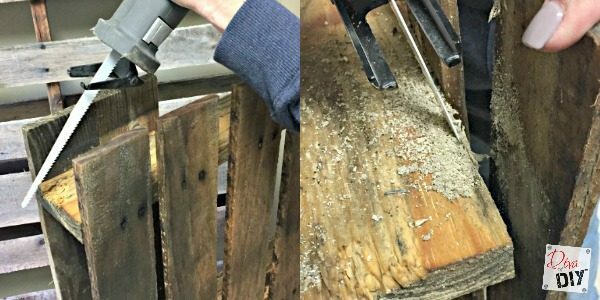 Step 3) Using your reciprocating saw or a jigsaw , cut the center braces out so that you can fit your other pallet into it. Read all of the instructions because this will make much more sense. Here is a picture of how it will look from the side. 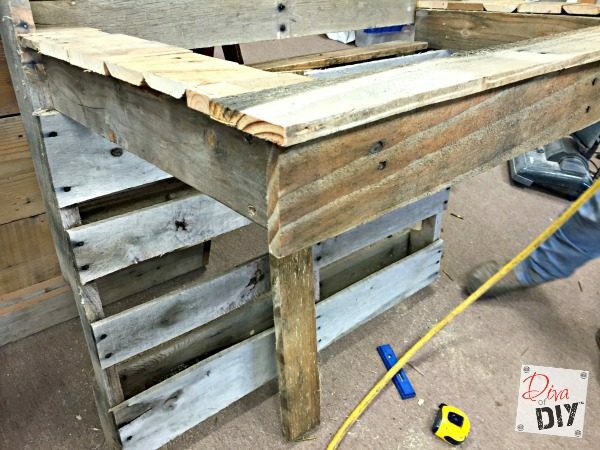 Step 4) You should have all of the wood you need to finish your DIY Cooler. Step 5) Using your mitre saw , cut boards to make frame of the sink. Step 7) Repeat on the other side. 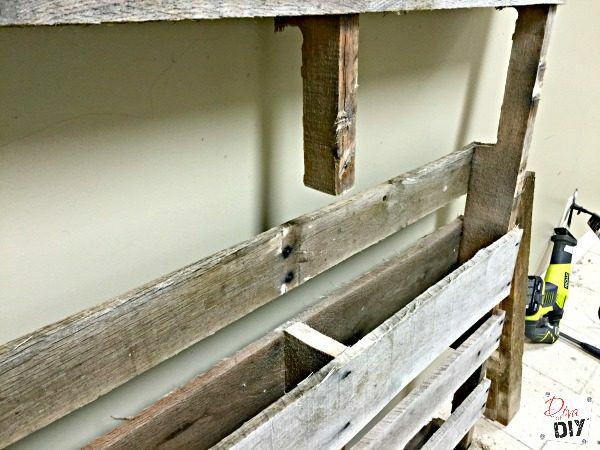 Step 8) Reattach Pallet boards to the new frame. 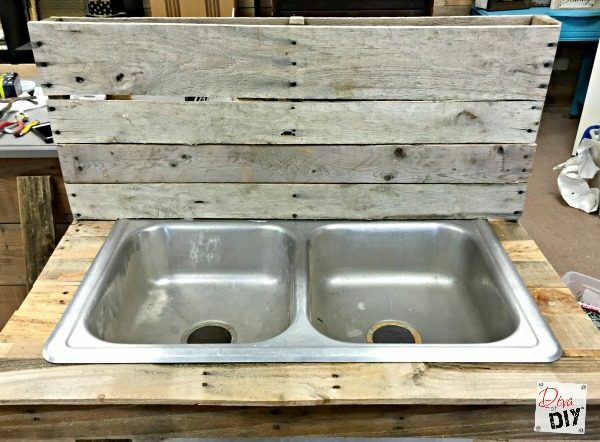 Step 9) Set sink on top of the full pallet boards. 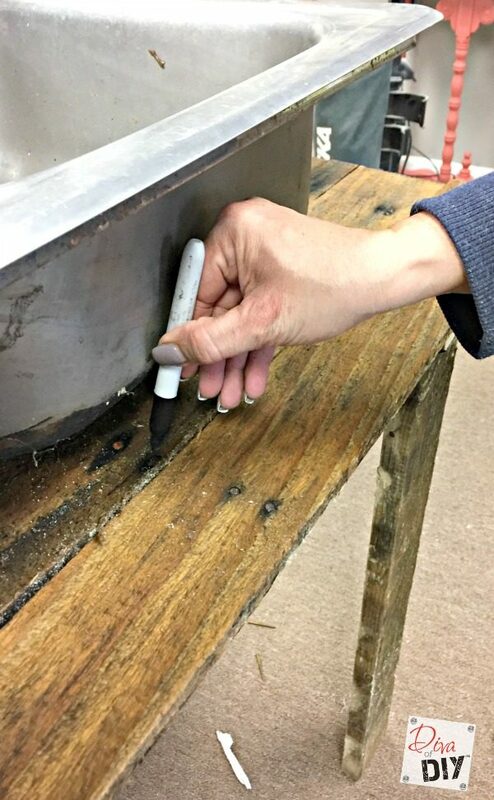 Step 10) Using a sharpie , outline the inside liner of the sink. 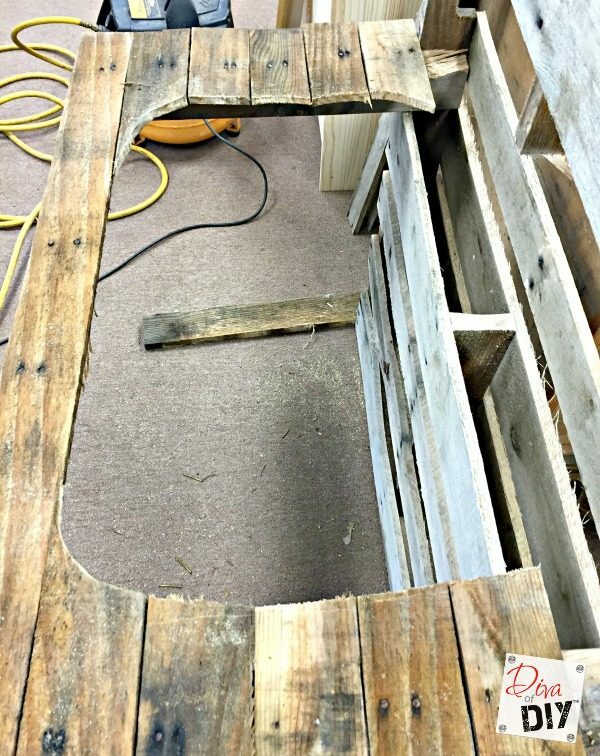 Step 11) Using the jigsaw , cut out the center of the pallet top. Step 12) Place sink back in the hole. If it doesn’t fit flush, adjust accordingly. This is what it will look like from straight on. Step 13) Measure for the bottom legs/braces. Step 14) Attach the legs in an L-shape. Attach to the pallet with angle brackets . 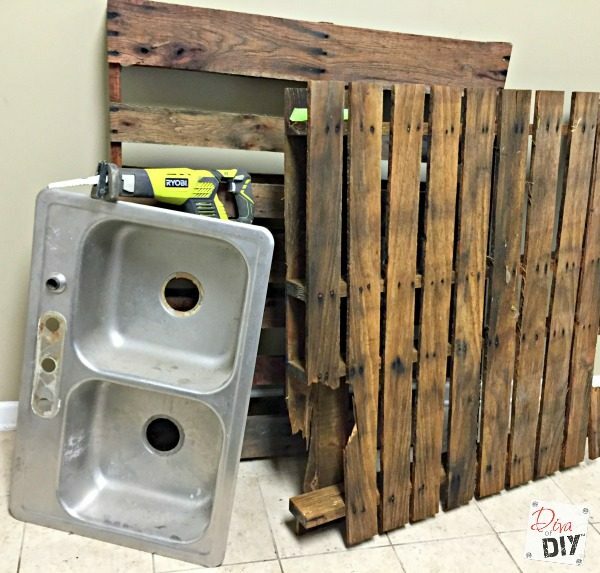 Step 15) Re-attach pallet boards across the back of the upright pallet to hide the sink holes. 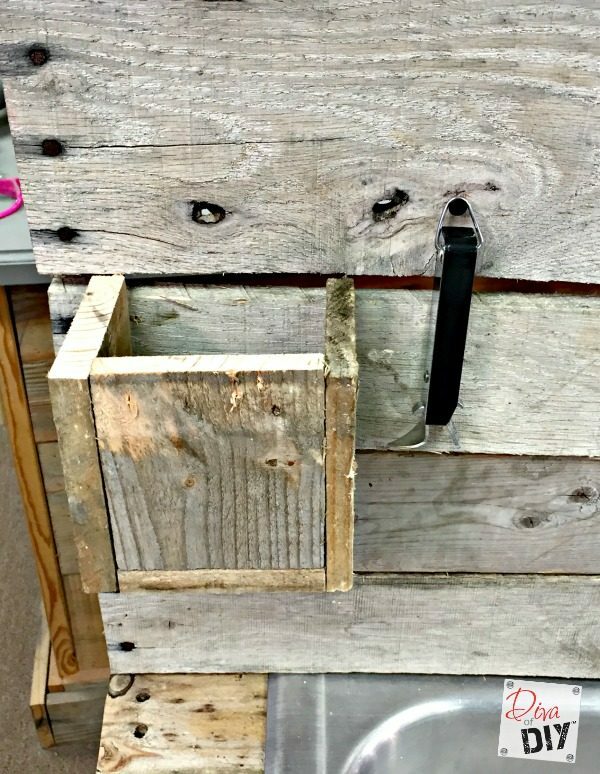 Optional Step 16) Using scraps of the pallet wood, make a box to hold bottle tops or tabs. 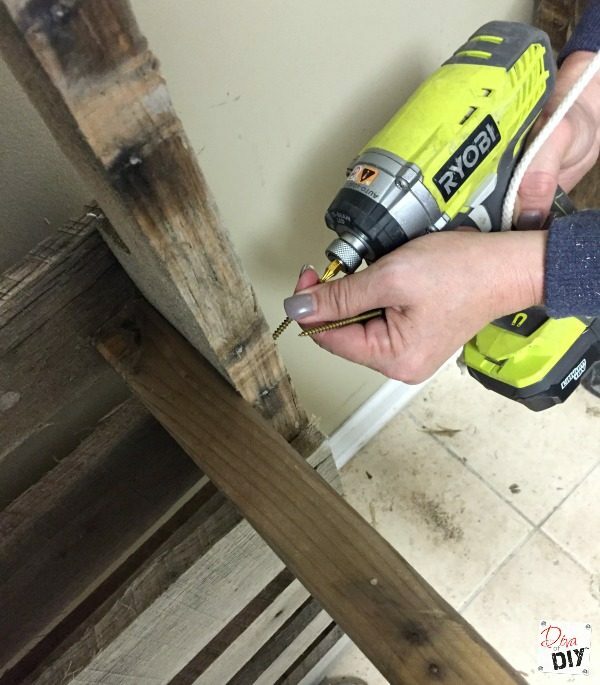 You also hang a bottle opener from a screw or nail. Step 17) Add some screen or sink stoppers to plug sink holes. Fill with your favorite drinks! I can’t wait to fill this up on the dock at the lake this summer! 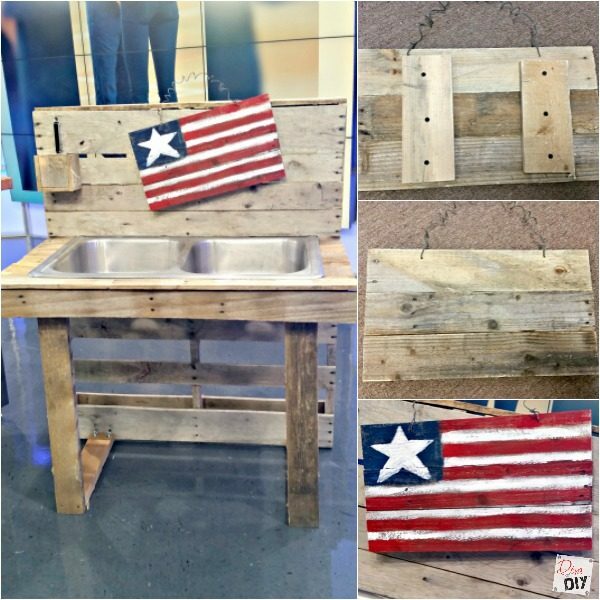 Make a quick pallet flag to hang on your station to celebrate Memorial Day and Fourth of July! Now how cute is that!! This is so cool. 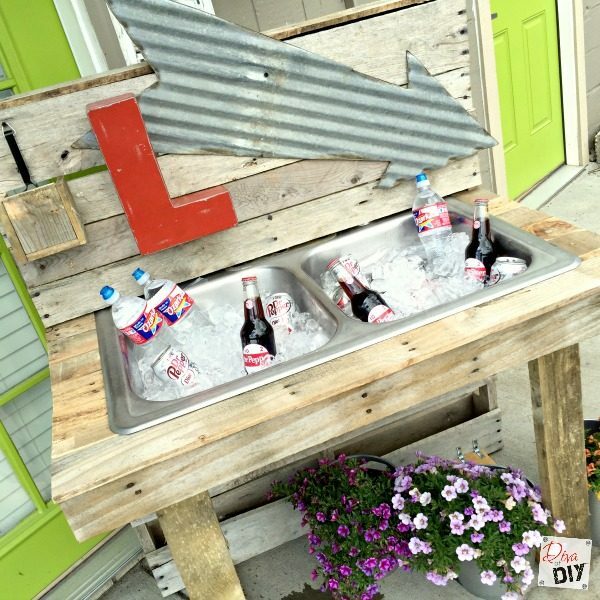 What a fun project and now you will keep the drinks cold in style. This is such a clever idea...very nicely done!! Thank you Christy! 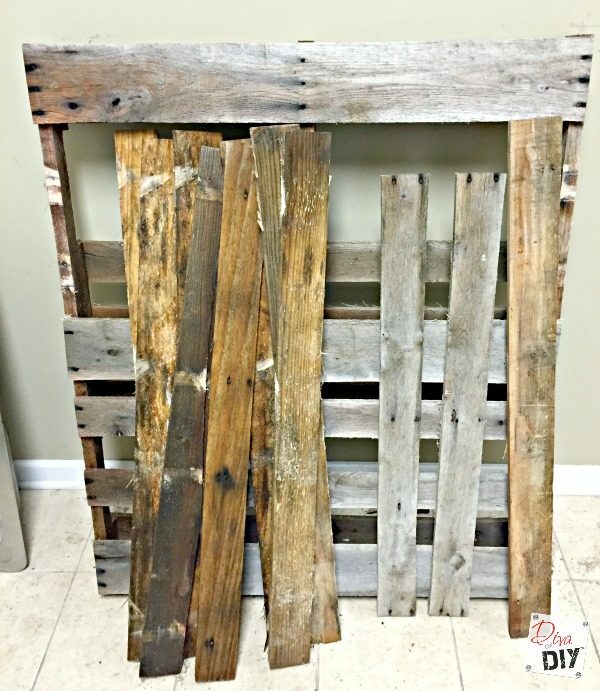 I love pallet projects! Thank you Alina! Yes, I have seen little water stations made with these sinks as well! Just shorten the legs. Make sure it is strong and steady for your little guy! I love your project. The thing that makes this so cute are the decorations you put on the back. 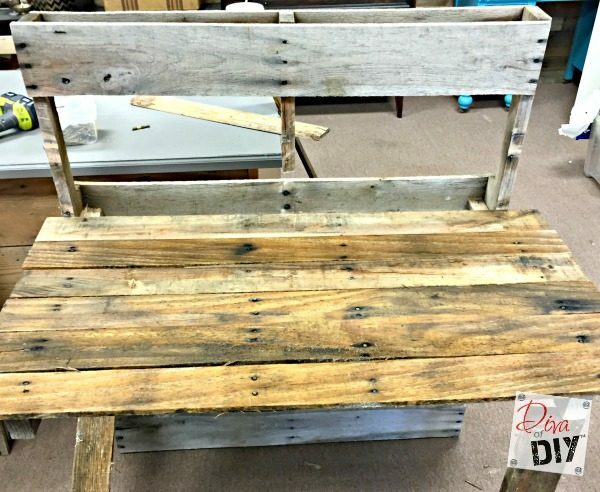 I also love the re-store and we are lucky enough in Pittsburgh to have a store called Construction Junction, which is a treasure trove of wonderful items to repurpose. Thanks Melony! It will be nice to be able to switch out the decorations on the back of the drinking station. We do not have a Construction Junction, that sounds awesome! It would work perfect for that as well! My boys are catch and throw back, they don't clean fish and Mom doesn't either. Lol! Glad you like it! Thanks for the encouragement! Thank you Christy! I am so glad you liked it and the feature is a great bonus! I enjoyed the party! That's great Pam! I hope your Dad pulls out his mad skills! 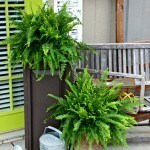 This is such a fun summer project! 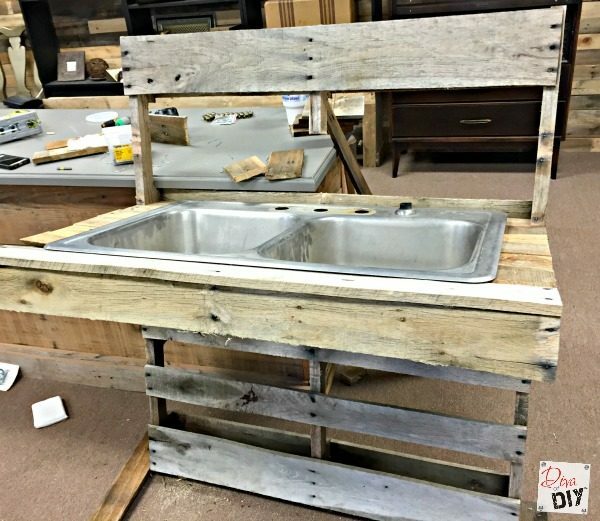 I can't believe that you made something this cool from two pallets and a sink. Thanks for the tutorial, I want to give it a try! Send me a pick if you do! I hope you enjoy it, I love mine! This is so fun!!!! I have that exact sink sitting by my trash cans! Fantastic idea!!! 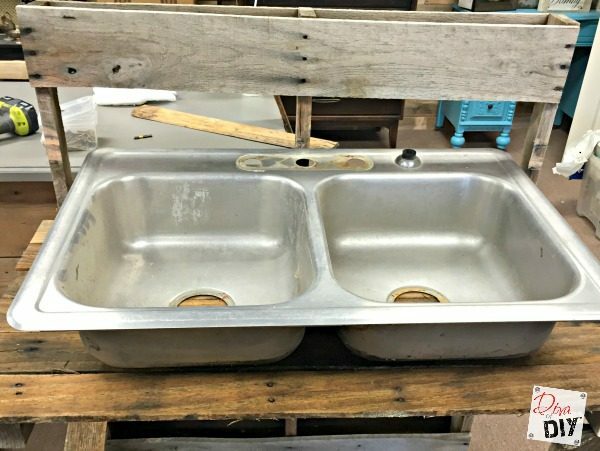 Go grab that sink and share a picture with us! This project is calling your name! Thank you for stopping by and checking it out! 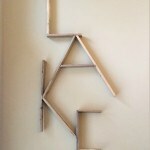 Awesome project and thanks for sharing :) Really a fun project!! Thank you! It was fun to make as well!